In 2006, St Andrew’s RC Secondary in Glasgow’s East End surpassed all expectations in their HMI Report. The school, located in one of the poorest areas of Scotland, ranked higher than leading private schools. This defied national statistics which showed that poverty negatively impacts young people’s performance. But looking closer this wasn’t the whole picture. Glasgow, which has just 10% of the nation’s population, has 20% of Scotland’s care-experienced young people. Their outcomes, even at outstanding schools, fell far below average. Only 4% of St Andrew’s care-experienced young people stayed in school after age 16 and only 31% went onto a positive destination compared to 90% of their peers. Care-experienced young people are just as talented as any other – but when they have a difficult homelife it can deeply affect their relationship with school. 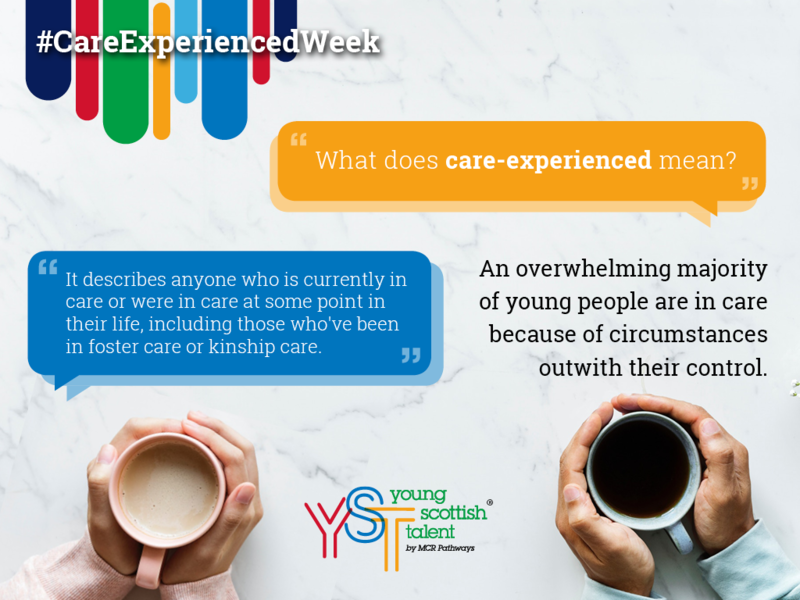 The 22-26 of October has been Care-Experienced Week and we’ve spent this time digging into stats and stories about young people who have experience with care. What we’ve seen – as in the case of St Andrew’s – is that we NEED to highlight the stories of these young people because so often their voices go unheard. MCR was founded to help care-experienced young people and to close the gap of inequality. Through mentoring, young people can gain the confidence they need to succeed. To make real change, we need to understand issues, include the opinions of care-experienced people in decision making, share stories and celebrate success. But most importantly, we need to give care-experienced young people the opportunity to tell their stories. Read on to see how we’ve used this week to do that. On Monday we focused on the issues faced by those in care. 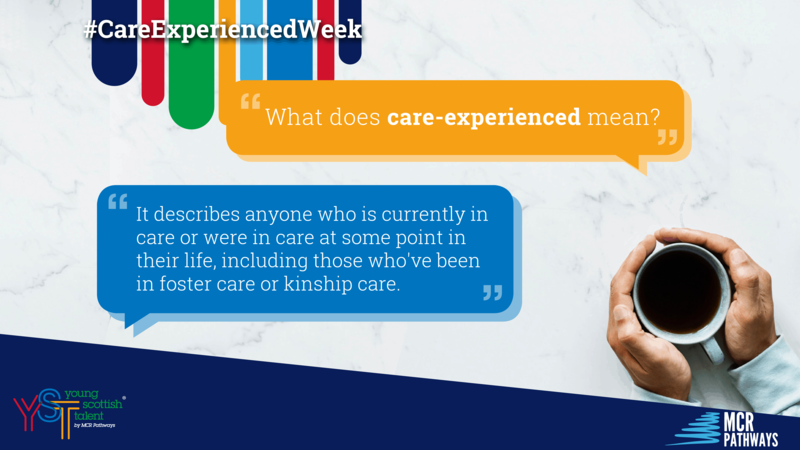 The term ‘care-experienced’ refers to anyone who has any experience within the care system, including those in residential, foster, or kinship care. The effects of care can last a lifetime, which is why the term care-experienced is preferred over care leaver. On Tuesday we shared the experiences of our young people. The voices of care-experienced young people are so important and it’s essential that they tell their truth in their own words. Stephanie tells her story. After moving to Scotland from Ghana with her mum, Stephanie spent time in care. She was wary of new adults and felt like she didn’t need extra help. In her mentor, she found someone to talk to who wouldn’t judge her. On Wednesday we shared partners and organisations that support those in care. Big change requires the cooperation of the whole community. Universities and colleges are a huge part of the picture. 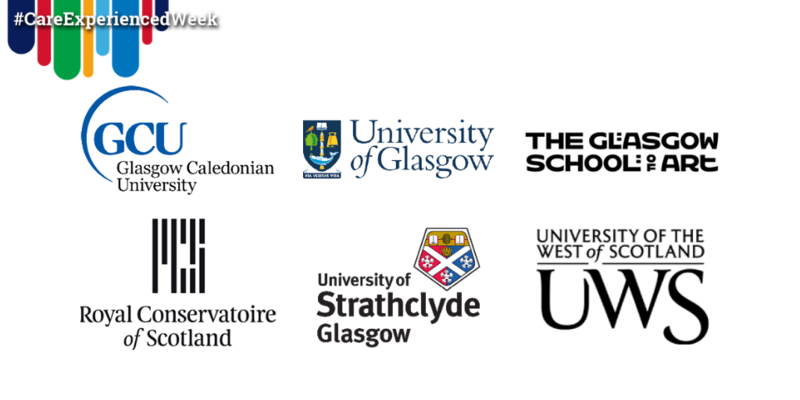 Glasgow’s colleges and universities have created widening access programmes to support students who come from disadvantaged backgrounds, and they offer Talent Tasters and extra support for care-experienced young people while they’re still in secondary school. On Thursday we explored people and fictional characters with experience of care. Representation, seeing your stories in fiction or the media, is so important. 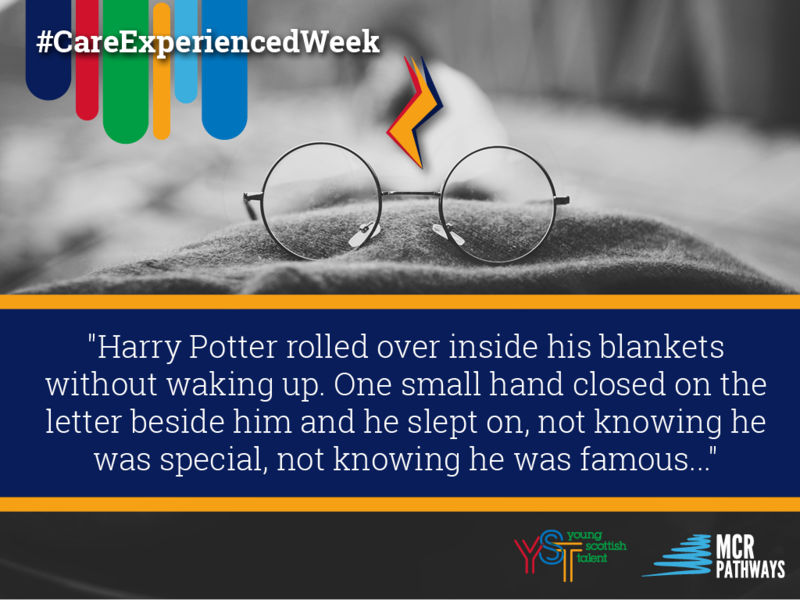 From Steve Jobs, to John Lennon, to even the famous boy wizard, some of our greatest talents and heroes spent time in care. 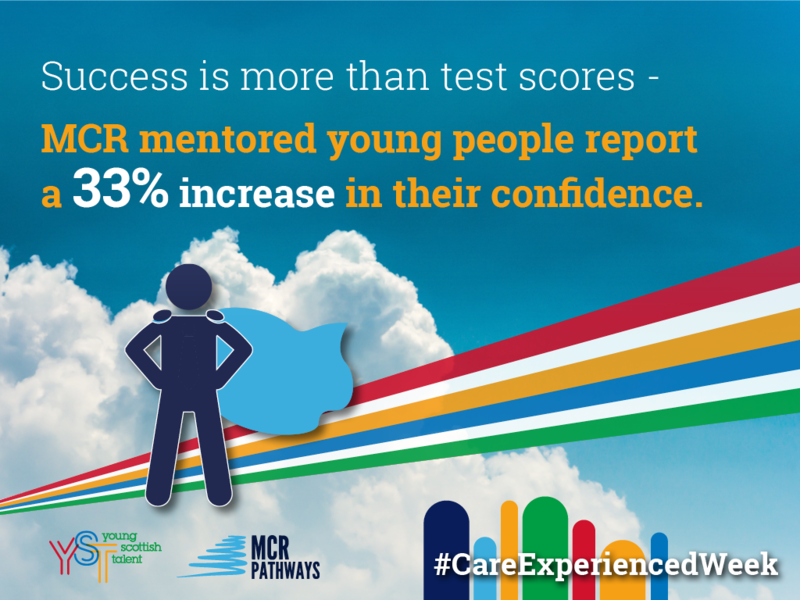 Lastly, on Friday we celebrated the enormous gains MCR care-experienced young people are making. *See Impact Report for more details. When one person mentors two lives are changed. 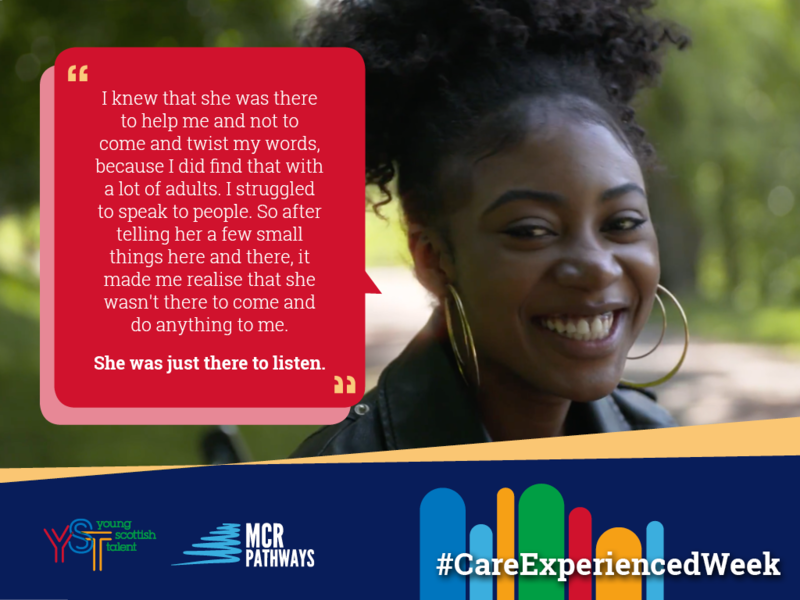 Care-experienced young people need that extra support to succeed, but when they get it they flourish. Can you become a mentor?